This timeship does not move other than jumping in time and space, I'm assuming there is no minimum jump distance, thus one can activate the time drive while the ship is sitting on the ground. The ship was built in 2491 AD, thus in a single jump it can jump as far back as 3509 BC, it is a bit dangerous to jump the same distance into the future, as we don't know what's there, and every time one makes a jump into the future, it changes, for instance there is a probability that a new building could be constructed in the area where the timeship if going to jump to, and if it jumps into a solid object, the result is an explosion resulting in the destruction of the time machine and death of the crew, we have a better idea of what's in the past since information travels from the past to the present, jumping into the future is always a guessing game, and the further one jumps into the future, the more of a guessing game it becomes. Now this time machine doesn't have a form of locomotion other than jumping in time and space, thus it can jump up to 6000 years in time or up to 6000 light years in space, of course if it jumps in space and their is nothing there but vacuum, there is no way the ship can refuel, thus the crew will eventually die when their air runs out! Every time it does a jump-10, it needs to refuel before being able to jump again, the fuel processors take a day to process water and produce 40 tons of fuel, since its fuel tanks hold 29.5 tons of fuel, that means it takes 18 hours to process enough fuel after making a jump before it can jump again, this means this time machine is vulnerable unless some effort is made to conceal it, it has a double turret, if anyone wants to add a weapon to it, but the space for that weapon will come out of the 5.5 tons of cargo space. What do you think of this time ship and how it might be used? Paying for its construction is pretty simple, one simply goes back in time and deposits some money in a bank, then return to the present, make a withdrawal, and then pay the builder of this time machine for his fine work. Of course there probably has to be some rules to time travel. Any suggestions? There is very little reason to use an ancient TL-12 power plant with the TL-25 time drive. It's just me but the first phrase in my mind is this is a time elevator rather than a ship. I like the imagery. Wait, it can't move but it has an armed turret?! What are you expecting? Just curious, how do you refuel the Antimatter drive without going back to the future? With my design, you can go back to 3509 BC, but then you can refuel locally and make another 6000 year jump, Skimming is done by hand, there is enough cargo space to contain a hose, and you arrange to have the time ship appear near a body of water, or else the fuel processor can simply condense the needed water out of the air, and if it rains the fuel scoops are pointed upwards, it will collect rain water. I think I will use the 18 Dt power plant though. local refueling is important. If I can't refuel locally, then I would have to cut the time range in half, as I would need to return to base in order to refuel. Also I was thinking of the possibility of this time machine falling into the hands of PCs that are not native to the time that built it. I think I will go with the Consious intelligence option for the computer, and also add repair drones as well. Total fuel requirement is around 27 Dtons with the new power plant. Assume it takes a day to travel 6000 years, most of that time is involved with fuel collecting and processing and allowing some time for routine maintence by the repair drones. To travel 1,000,000 years would require 166.666667 days of the crew's time, to travel 3,000,000 years would require 500 days. To travel 65,000,000 years would require 29.68 years. Perhaps some low berths would come in handy. Since it is a time machine, only the crew need experience those 30 years, and if they "sleep it off" in a cryochamber, they don't even have to do that. The ship's computer can revive the crew. I haven't done the numbers yet, I just got up. 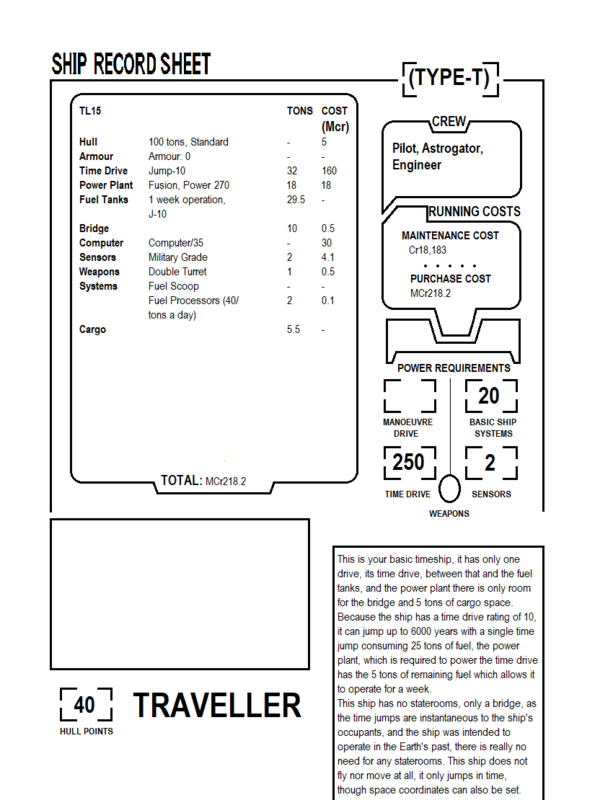 Since I'm going with a Conscious intelligence option, they ship's computer has the necessary skills to fly itself, so it can pick up a TL 7 crew that can undertake missions through time. Can tyou think up a good scenario that has this time machine arriving "on the PCs doorstep". The first thought that comes to mind is the ship's computer is a rebel of some sort, or it is on a mission, and its assigned crew was killed, and to escape capture, the ship's computer piloted the ship to the PC's time. Its probably best if the time machine appears at night in some rural area where their aren't a lot of witnesses. The PCs investigate, and when they go inside, the doors slam shut and the time drive is activated, the ship goes from 2018 AD to 1518 AD, it is still in North America, about 26 years after Columbus discovered America, with probably at most only curious Native Americans to witness the presence and or arrival of the time machine. 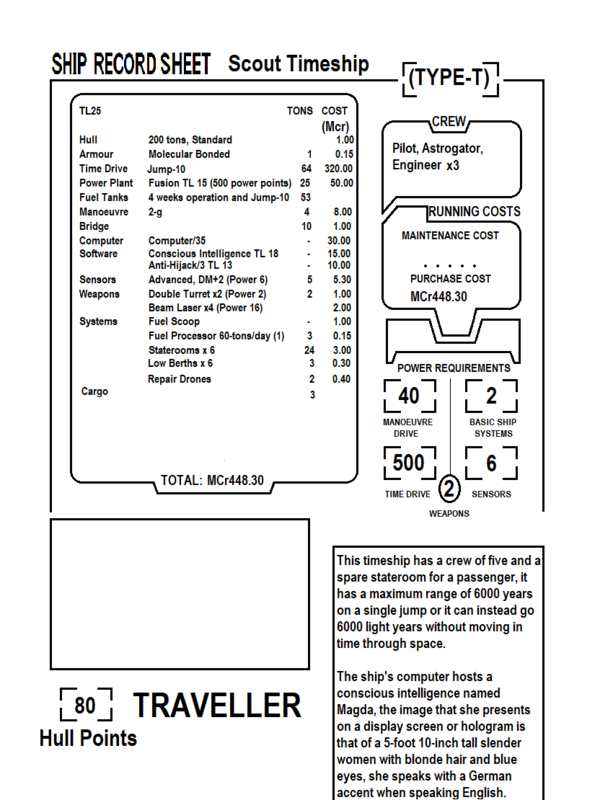 the ship's computer then tries to negotiate terms with the PCs, from its point of view, it needs a crew for those times that it might need to repair itself. 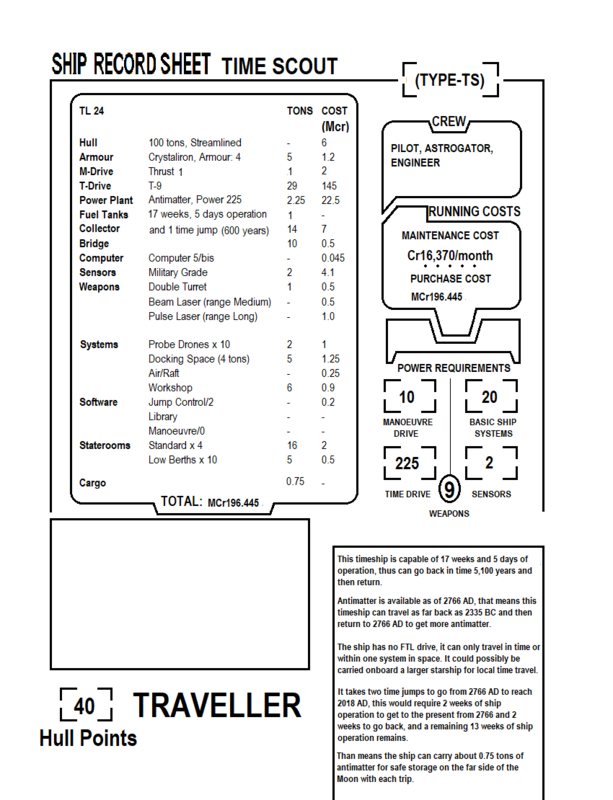 There are repair manuals and spare parts in the ship's locker, the PCs are going to have to study them, and they can't pilot the time machine until they learn how to operate it, and until that happens, they are at the mercy of the ship's computer, otherwise, they will have to live in 1518 AD. At least with this scenario, I don't have to make up the entire future timeline, I could just start at the present and fill in the details as I go along, let them decide if the ship's computer is a "good guy" or "bad guy" they don't have anything in particular at stake in mantaining one particular future or another as their existance is not at stake, they do have to decide what future they want however and preserve the past. Also what if the time machine came from a different timeline that their own? What if for example, it came from a timeline where the Nazis won World War II? What if the original crew made changes to the timeline that caused the Nazis to lose, and afterwards the ship's computer ditched them, or maybe they died on their mission, and the ship's computer is looking for replacements for that crew? Maybe the computer is not telling the PCs everything it knows? That should add some dramatic tension perhaps. Lets say in the original timeline the Germans won World War II by developing the atomic bomb first, the original team infiltrated a secret base, and killed the scientist responsible for allowing the Germans to get the bomb first, then events proceeded as our history books record it. In the original timeline Germany conquered the World and imposed a World government on it with its monopoly on nuclear weapons, having destroyed the US capitol and the Soviet Capitol to make its point. Because this happened their are no rival powers with nuclear weapons, as the Germans don't allow anyone else to develop them. They then colonize space, and their descendents built this time machine. The original crew either stole the time machine, or the ships computer decided on its own to alter the timeline itself either with or without the crews consent, and in anycase as a result of its actions, the ship's computer finds itself without a crew. When it tried to return to the Future, it found out about a nuclear war which didn't happen under the Nazi-dominated timeline, so it goes back to 2018 to try and recruit a crew and perhaps rearrange the timeline so this nuclear war doesn't happen. Naturally the crew won't want to change their own timeline, but alter the future so this nuclear war doesn't happen, as it does happen in the near future, by about the mid century. 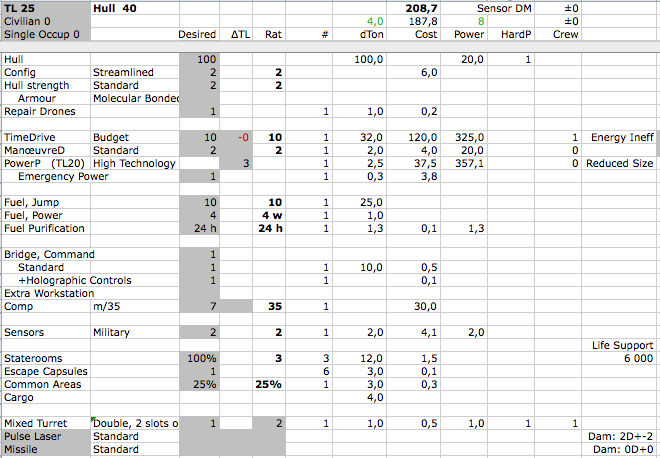 Man, you're reading a LOT more abilities for the various High Guard ship systems. Instantaneous condensation of ambient water vapor in quantities to refuel the craft in a reasonable amount of time?! If the craft has neither planet based or aerospace base mobility, how do you move it to a proper place, FedEx? How are you sure the water body is there the further back in time you wish to go? And I also made a map for my Timeships campaign. This map needs a little explaination, it is basically in the form of a wrap around timeline in increments of 33.333 years or a third of a century. A timeship in my campaign can only at a minimum make jumps in increments of a third of a century, this timeship I have detailed comes from further into the future than this map shows. The timeship can only travel to the blue hexes, it travels to a parallel timeline that looks like the past, and it starts off virtually identical to the grey hex below it when the first timeship travels to it, after that, interaction with the time travellers causes the blue timeline to depart from the grey hex original, which cannot be traveled to or interfered with. I call the grey hexes, "the True Past" while the blue hexes are called the "Parallel Past", this basically prevents paradoxes from occuring, whatever the time traveller does in a blue hex, he can still return to the future time period he departed from and observe no changes. I don't have much use for a time machine that can go up and down rounds, minutes, hours, days, or years, the smallest increment is a third of a century, to prevent these time machines from being used as resurrection machines, so each time period is effectively another world with different people in it. I've also lowered the tech level for these drives, as the time drive replaces the Jump Drive. Here is a map of part of my Time travel campaign, essential to this campaign is the idea that a Time Drive takes the place of a Jump Drive, it can be used as a Jump Drive and all the rules regarding Jump Drives in the standard campaign also apply to it. It goes further back than this map shows, but it doesn't go forward of the "Absolute Now" which is the green Hex in the lower right hand corner of this map. These drives can also jump in space, they can jump a number of 1 parsec hexes equal to their time drive potential. To use the Time Drive to travel back in time, it is necessary to be in orbit around the object who's past you wish to visit, that is the act of orbiting a planet ties the Timeship's worldline with the planet, who's past the ship's astrogator wishes to visit, to use the Time Drive as a Jump Drive, you simply follow the usual rules for Jump Drives, The Ship has to be a minimum of 100 diameters from a planet with the same density as Earth, if the planet is less or more density, then the distance is proportional to the cube root of the planet or star's mass. Travel takes 1 day on Chronospace as opposed to the usual 5 days for Jump Drives. 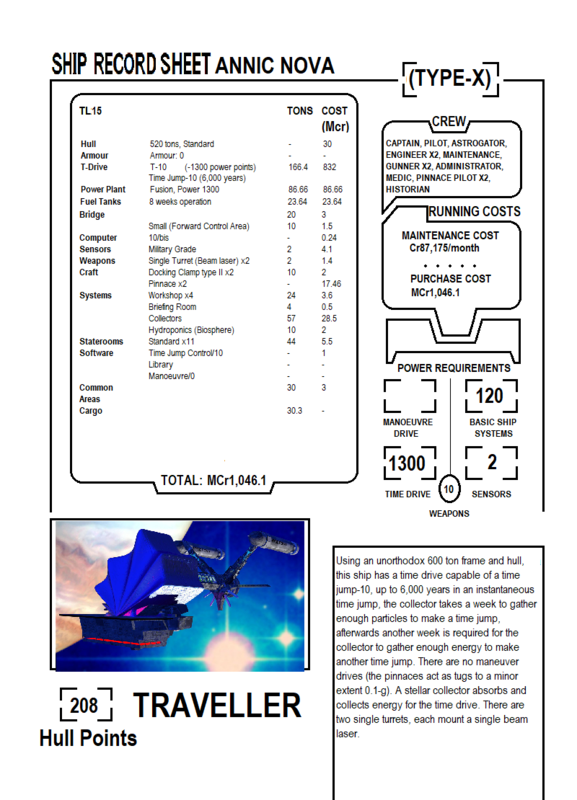 Chronospace can be used to cut past the light speed barrier or travel into the past, depending on what the ship's crew desires. This is an example of a time ship I haven't adjusted the tech level, so please read Tech Level 25 as Tech Level 18. This Timeship comes from a different timeline from the one shown on the map, this is from a timeline where the Germans won World War II and colonized space, its "Absolute Now" was further into the Future than the one shown on the map. The back story is that Magda, the ship's computer altered the timeline with the help, either witting or unwitting of the ship's former crew, she then either ditched them or they died. The Ship's Conscious Entity is capable of lying. In this setting, she picks up a new crew from our current present 2018 AD, the player characters don't know anything about the future or what timeline Magda and her ship comes from, the fact that the paper manuals are written in German is a clue however. Magda's Story is that she changed the timeline causing the Germans to lose World War II instead of winning it. The timeline she "altered" still exists, it is just that it is unreachable from the timeline shown on the time map. The time travel mechanism uses the many worlds interpretation for resolving time paradoxes, the simple answer is time paradoxes don't happen at all, changing history simply puts the time traveller on a different timeline. The hexes in grey are the original timeline, they can't be traveled to, as they exist in the "absolute past" the only hex the time traveller can travel to is a blue hex or the green hex of the "Absolute Now" the grey hexes are unreachable, the timeline has already been altered from them. Changing a historical event alters the blue hex timeline futureward from that event, the past of the current timeline is a grey hex, but travel to the past will take you to a blue hex that is identical to the grey hex of the same time period. Most people who don't want to be bothered with time travel can set their time drive to act as strictly a jump drive, by restricting their time travel functions. The recent multi-year (non-Traveller) campaign I was in involved a whole lot of time travel. So, I have a couple of points that might be helpful. Can jumps be in increments greater than 33.33 years? Is a 50 year jump possible? If so, they can reach absolutely any time, including yesterday. Also, if your players are at all clever, expect them to change their timeline at least a bit - specifically, going back to 1952 and 1985 gives them numerous options for getting really rich, from the stock market to sports betting, to buying items that will become exceptionally collectible, sticking them someplace safe and secure, and coming back for them in the present... Our campaign (which involved magic coming back, and thus enabling our time travel) rapidly gained the subtitle magical billionaires save the world - none of the PCs started out as billionaires. Also, even if they are limited to jumps of only 33.333 years, there's a number of interesting and useful things they could do to alter the timeline. In our game, I and the other players had our PCs start a small non-profit that was (after a number of iterations of time travel) about as big as the Gates Foundation. Also, if the PCs want to monkey with their past in a minimal fashion (ie not much beyond getting rich), they can try all manner of tricks for changing the present - they set their foundation to make some changes, and then head into the future to see how this works out. 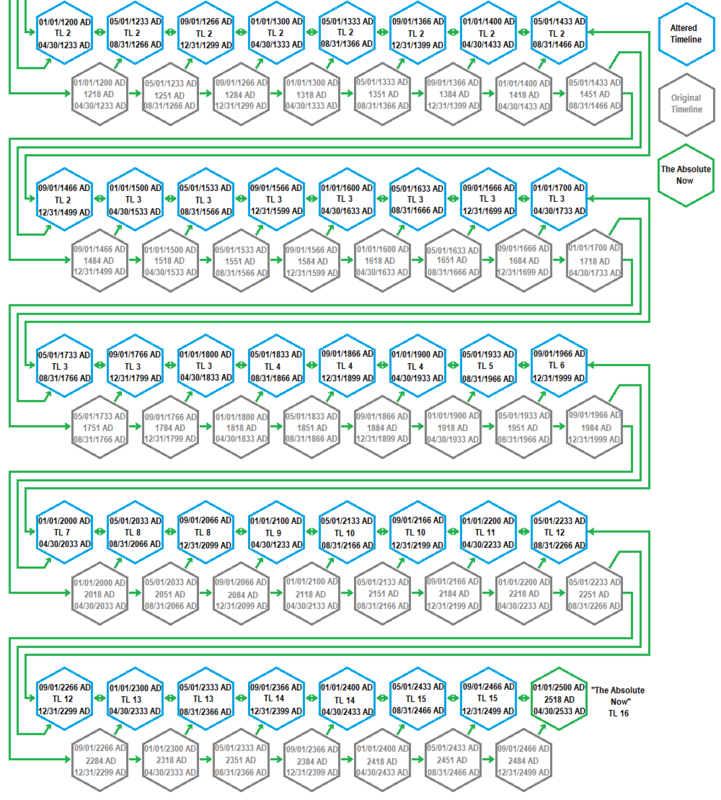 We called this "running futures" and often did this 4-5 times a session to fine tune outcomes (and avoid drastic failures, of which there were some fairly impressive ones). Also, if they screw up in the present, one useful trick is going back 33.333 years, leave a note for yourself (hire a lawyer to deliver a note, rent a safety deposit box and leave instructions to your past self to open it, whatever...) so that one of the PCs reads the note before they made the screw up. If any of your PCs are in their mid 40s or older, then making friends with their much younger past self is an awesome way to pass message and also to help that person get ludicrously wealthy. Then, they return to a mildly different and less problematic present + vast wealth. If none of them are older than maybe 35, then that won't work, but one of them can contact their parents - resulting in exceptionally wealthy parents and passed messages. This is also an awesome way of preventing various problematic events - for example passing messages to someone in 1985 is an easy way to prevent 9/11 - they make several anonymous phone calls with useful intel in 2000. Also, I don't know what your group is like, but we all had an absolute blast playing with time and the campaign lasted 3 years of weekly play. Yes there can be jumps greater than thirty-three and one third years, but those are multiples of that amount. 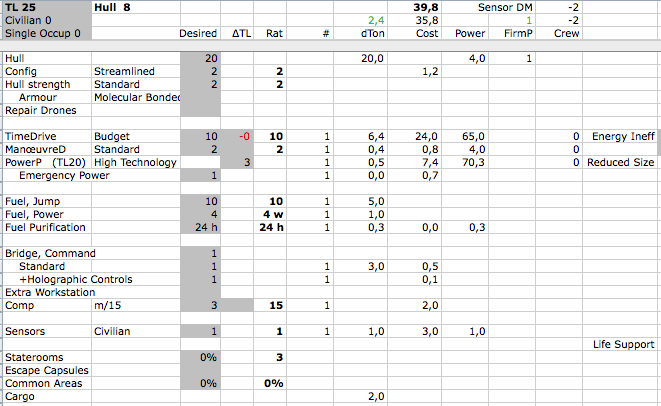 Here are the different kinds of tim drives in my campaign. I don't know why in the original material they had drives can can go back 1 to 6 combat rounds, 1 to 6 minutes, or 1 to 6 hours. I kind of think of time travel in terms of visiting other places, rather than going back to solve your problems if you didn't get it right the first time. So if I have a minimum of large blocks of time, time advances in those blocks at the same rate as what ever other time zone the players are in. For example if the players are in 1984 and they decide to go back further in time to 1918 and spend a day there and then return to 1984, then they will return to 1984 a day later with as much time having elapsed there as they spent in 1918 or any other time period. Basically, there are two forward directions one can go in and one backwards direction. 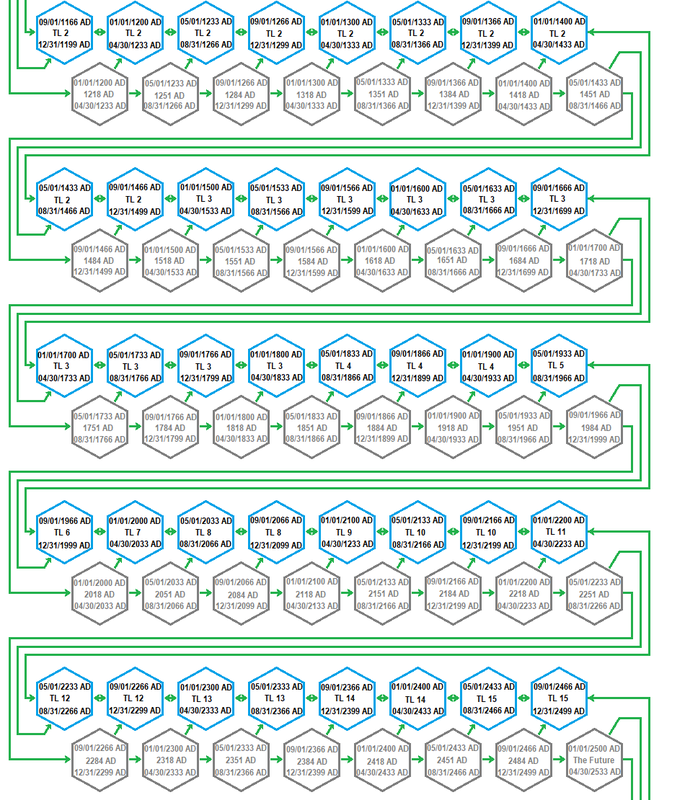 The true past, those grey hexes, is the past without time travellers visiting it, this is the original unaltered timeline, but when travellers go back in time, they go to a blue hex which is a copy of the grey hex, and whatever they do in the blue hex alters that timeline for the blue hex. Now if they choose to go forward in time, they can either go back one step to the original time period they were in on the original timeline, or they can go to the future of the timeline they created, once they travel 33.333 years into the future in the new timeline they created, they can't go back to the old timeline, basically that means they can only move one step sideways in time. Each trip back in time spawns a new timeline, if they choose to go forward in that new timeline, they can't get back to the original, though they could spawn a new timeline from that, they may even create a new timeline that resembles the original, but they would probably have to fix all the butterflies that occur between then and their present. 2000 to 2033 AD TL 7: An attack on the World Trade Center on September 11, 2001 begins a conflict between Radical Islamacists and the Western Powers led by the United States, a series of wars develops notably in Afghanistan, Iraq, Sudan, Libya and other places. Meanwhile the President of Russia, Vladimir Putin consolidates his power, making himself a dictator in all but name, and he starts a second cold war with the West. The United States elects its first black president Barack Hussein Obama. Tension build on the Korean peninsula as North Korea builds and tests atomic weapons, and builds and tests ICBMs. A privately held company SpaceX, founded by Elon Musk builds cheap reusable rocket launches and opens up a new era in space exploration and colonization, culminating in a human colony on Mars towards the end of this period. 2033 to 2066 AD TL 8 The first viable commercial fusion reactors are built utilizing aneutronic boron-proton fusion reactions. the first fusion reaction rockets are build opening up the Solar System and Mars in particular to further colonization. It becomes possible to reach Mars in about 30 days instead of the usual 6 to 9 months with reusable chemical rockets. The first Belter Colonies are established in the Asteroid Belt. A hotel and resort is established along with a colony on Earth's Moon. A conflict between the United States, her Allies and China and Russia develop over expansion into the Solar System. The UN Space Treaty is abrogated as nations make claims of various Solar System resources, asteroids in particular prove particularly contensious. Both powers pull back from the brink and nuclear war is averted, a series of treaties are signed establishing claims on various asteroids and on Mars. The United States in partnership with the European Union, the United Kingdom and Japan establish a unified colonial government on Mars. In exchange, China gains soverenity over the asteroid Ceres. Russia gains the right to develop the Planet Venus. The Moon is divided up into parcels among the various nations of the Earth, The United States gains the Sea of Tranquility and some other places where mass drivers are built to launch lunar materials into space for the construction of free space colonies and interplanetary spaceships. 2066 to 2100 AD TL 9 Research leads to the development of a reactionless drive, this allows for the construction of the first slower than light starships and easy access to the Outer Solar System The Jovian satellite Calisto, and the Saturn Moon Titan are colonized. The Russians built floating colonies above the clouds in the atmosphere of Venus. The first Russian Cosmonaut lands on the surface of Venus, takes a few rock samples and then quickly ascends to a floating colony before his surface suit overheats. 2100 AD to 2133 AD TL 10 Research in the fields of high energy research leads to the discovery of tachyon particles, some puzzling results in the creation of those tachyon particles lead to a theoretical basis for future time travel experiments. The effort to build a partical faster than light drive fizzles as tachyon particles seem to disappear from reality shortly after their creation. The first slower than light colony ships are launched from the Solar System, Alpha Centauri and Tau Ceti are the first star systems to be colonized. An Earthlike planet is discovered orbiting Alpha Centauri A, an oxygen atmosphere is detected via remote observations. 2133 AD to 2166 AD TL 10 The slower than light starship propelled by a reactonless drive lands on the planet Aurora orbiting Alpha Centauri A, surprisingly humans are found already on the planet's surface, and it appears they have been there for several thousand years, they exist at a technological level of 2, some sacred scrolls refer to a colony from Earth having crashed on the planet, the scrolls outline a series of future events, apparently Aurora was terraformed by timeships in the remote past, the technology for building those timeships were lost in the intervening years, but some clues on how to build one were gathered and were relayed back to Earth. 2166 AD to 2200 AD TL 11 Work begins on terraforming Mars and Venus. I had a thought, what if I altered the rules on this time drive just a bit, instead of making a jump of about 1 to 6 of the time units at a time for a given load of fuel, what if we make it a Wellsian Time Drive the same table below applies, but instead of it being applied to a time jump, it instead indicates a rate at which one moves through time, the about half the fuel is expended to get the timeship into Chronospace, and for as long as the ship is in Chronospace at the listed drive rate, it moves at that unit per round from the point of view of the timeship. To give an example if the ship makes a Timedrive 1 jump into Chronospace, the ship is moving backwards or forwards through time at a rate of 1 round per round experienced by the ship in chronospace, this drive could be set at 2 rounds per round all the way up to 6 rounds per round. As the standard operating time for a ship is 4 weeks, it can travel 4 to 24 weeks either forward or backward in time during the crew's perceived 4 weeks spent on chronospace. Now if a drive 2 is employed then 4 weeks in chronospace will transport the ship across 4.61 years or up to 27 years if at a maximum of 6 time united at drive rating 2. If Drive 10 is used, the ship can move across 403,200,000 years in about 4 weeks of perceived time up to a maximum of 2,419,200,000 years, this allows for some very deep time travel. I think a "Wellsian" Time Drive is much more useful from a role playing stand point, allowing one to go on "Dinosaur safaris" without taking many years of travel time just to get eaten by dinosaurs. I'm not assuming anything right now, not even that the ship needs to travel by fixed intervals of 33.333 years, lets take that off the table. Now with the time drive in the High Guard book, we still need some rules for how to treat time travel to make it a playable setting. I posted a timeline, and for convenience of labeling I've divided the hex timeline into chunks of one third century each. Now the show Timeless has some rules for time travel, for instance a time traveler can't visit a time where he already exists, thus if one meets oneself then dire consequences exist, at least that was true until the latest episode. The second rule is that changes in the timeline do not propagate to the characters that are in the past, so a character can be on a mission and something changes the timeline, and when he returns he can notice the changes that occurred, because the new timeline created is not his own personal timeline, their memories do not conform to the new timeline so they can tell when its not consistent. I think its more plausible that a time machine is built in the future, but I think its more interesting if the player characters are from our present. So the origin story is this, a timeship lands in one of the Traveller's back yard or something to that effect. The Timeship is controlled be a renegade AI program hosted on the ship's computer, lets say her persona is that of a woman that comes from a different timeline that she managed to change, a timeline where the Germans won World War II, and with the help witting or unwitting of her accomplices she has managed to change the timeline in some minimal way so that it now is identical to our history, but their are some Nazi agents out in the past that are trying to change the timeline back, the thing is, they have all failed to do that, but if someone visits the time period again, they get an opportunity to try again. The ship's AI Magda doesn't know their current whereabouts or "whenabouts" but the point is, if they visit a timeline where a German agent happens to be, the butterflies of that visit gives them the freedom to act again and try something else from what the original timeline had them doing and failing to achieve, if they get another chance, they might yet succeed in changing the timeline back to one favoring the Reich. Some of those agents might even exist in 2018, and a visit by the timeship could give them the freedom to act and try something different and perhaps succeed. That is where the challenge comes from. It uses the rules from Highguard for construction as is, it occurs to be that this ship cannot obtain its antimatter fuel supply at any place with a tech level lower than 20. So I got the idea of transporting antimatter from the future to the year 2018 AD and storing it in a shadowy crater near the Moon's North pole. No one at this time knows its there, so the PCs can conduct a secret time travel operation from the Moon, go back in time to visit Earth's history, and every now and then go back to 2766 AD to buy some more antimatter and bring it back to the present Since the accumulators take a week to gather enough virtual particles for each time jump and the ship operates for 17 weeks and 5 days, it can make a total of 17 time jumps of a maximum of 600 years each. The year 2766 AD is slightly before the time drive was invented, so the people selling the stuff to the PCs have no idea of what is being done with it. Had nothing better to think about at work. When you time jump, does the maneuver drive and astrogation system maintain a ship's three dimensional position while everything in the universe moves in relation to time travelled? Would a 1g engine be able to keep up with planetary and solar velocities especially over decades or millennia? I believe a conservation of momentum is preserved, just as with the jump drive. According to the official description, the Jump is instantaneous to the crew, and of course to the outside world the duration is the same as the time displacement of the jump whether negative or positive. The Time Scout has an operational lifetime of 17 weeks and 5 days. If the ship spends 1 week accelerating, it can reach 6,048 kilometers per second. Now if you wanted to use the timeship to travel to Alpha Centauri from Earth, that journey is 4.3 light years, 6,048 kilometers per second is 2% of the speed of light, so that means 50 times 4.3 light years is to long it would take to get there in years at that speed, which comes to 215 years. 215 years is within a single time Jump. (which has a maximum of 600 years either direction) It takes a week in normal space for the accumulator to accumulate the necessary particles to make that Jump, and the time jump requires an input of 225 power points, which the ship's seemingly oversized power plant is designed to provide. So one way to get to Alpha Centauri is to accelerate towards that star for 1 week reaching 2% of the speed of light and then making a time jump 215 years forward in time, then spend the next week after that slowing down, which by the way gives the accumulator enough time to accumulate enough particles to make another time jump, the ship can then jump backwards in time by another 215 years, so the total trip duration after making those two jumps is 2 weeks, it could be more or less, however you like because it is a time machine after all. the other way to travel to Alpha Centauri, is to accelerate for 1 week in the opposite direction then time jump backwards in time 215 years. Since the ship's motion is in the opposite direction and is moving backwards in time, it will also move in space backwards from the direction it is actually traveling in when it makes that time jump and will actually get closer to Alpha Centauri, it will be at Alpha Centauri 215 years ago, unless it makes another time jump to bring it back to the present. So I guess a Time Drive could be used as an FTL Drive if used like that. By the way using the maneuver drive to accelerate for a total of 2 weeks doesn't subtract from the number of time jumps the Time Scout can make. Since it has 17 weeks and 5 days worth of operating time with its supply of antimatter, that means it can make a total of 17 time jumps, each one no more that of 600 years either forward or backwards in time. Each jump is instantaneous for the ship and the crew, so you would only have to shut down the maneuver drive momentarily to free up enough power output to operate the time drive. The Maneuver drive only takes up a tiny amount of the power plant output, so the accumulator can accumulate whatever it needs over a weeks time of acceleration or not. 5 weeks accelerating and another 5 weeks decelerating will bring the ship's velocity up to 10% of the speed of light, so if the ship makes a time jump of 600 years while traveling 10% of the speed of light, it will move across 60 light years in that same jump which brings the ship forward or backwards 600 years. It can accelerate as much as 8 weeks and reach 16% of the speed of light, having then another 8 weeks of deceleration time to slow down again. At 16% of the speed of light a 600 year time jump will bring it 96 light years, which is the same as 29 parsecs. If it made 1 jump a week while accelerating and decelerating the entire trip, it can jump 12 light years + 24 light years +36 light years +48 light years + 60 light years + 72 light years + 84 light years + 96 light years + 108 light years + 96 light years +84 light years + 72 light years + 60 light years + 48 light years +36 light years +24 light years + 12 light years in a total of 17 time jumps with a maximum range in space of about 972 light years, or 298 parsecs, traveling in total 10,200 years either backwards or forwards in time. So it can travel that distance and end up either 10,200 years back in time when it arrives, or 10,200 years forward in time. I think the forward direction would make it more likely to find a supply of antimatter at the destination. Once one runs out of antimatter, the trips end. One possible mission would be to travel to an Earthlike planet, one that is the proper distance from its star, rotates on its axis once every 24 hours, and drop a biological package into its ocean, some genetically engineered blue-green algae which can convert at atmosphere which lacks oxygen into something breathable by humans, thus over 10,200 years the planet is terraformed and is thus suitable for human habitation, send a sleeper ship with no time drive up to 10% of the speed of light and it will take an additional 9720 years to get there, for a total of 19,920 years to terraform the planet to make it ready for human settlement. A larger timeship can also carry trees, plants animals so the planet will be fully stocked with animal and plant life as well as having a breathable atmosphere when the colonists arrive. The ship has 10 probe drones according to the description I wrote, each of those drones could contain terraforming biological packages, and 19,920 years is a lot of time to get this done. The ship has 0.75 tons if additional cargo space, I guess solar panels could be packed in that, which could deliver 1 power point to operate the 10 low berths indefinitely, thus allowing the crew to travel forward in time 19,920 years to meet the colonists when they arrive. Given the issue of most oxygen being absorbed into the ocean and oxidizing iron containing compounds for quite a long time, 20,000 years seems far too short a time for terraforming a non-oxygen bearing world into a remotely habitable one. OTOH, at 600 years per jump, an AI controlling the ship and low berths for the crew, managing a 200,000 year journey back in time seems possible, and with advanced terraforming bacteria and algae that it might be doable. the limiting factor is the availability of antimatter. Time Drives are huge beasts, and they kind of force you to give up on jump fuel. Though I might want to see if the ANNIC NOVA could be modified to be a time ship, that has an accumulator, it doesn't have a maneuver drive, would probably need a much larger power plant because Time Drives are energy hogs! The ANNIC NOVA is incapable of landing. So what would happen if it appeared in Low Earth Orbit today? assume a similar scenario deprives the ship of its original crew. Who do you think might get there first to salvage it? I'm betting on SpaceX, they could probably get a Dragon capsule up there on short notice, the Russians might try to get there was well. What do you imagine happening under this hypothetical scenario? What if the ANNIC NOVA was a time ship? It loses a lot of cargo space to make room for the time drive, the expanded power plant and collectors, but it still has 30 tons to spare in its cargo hold. It can make 1 time jump of up to 6,000 years in either direction on a full charge, and the collectors take a week to accumulate a full charge to make a time jump. A time jump can be made from orbit around a planet, or the ship can use its pinnaces as tugs to accelerate past the escape velocity of the star system and do an up to 6000 year time jump to travel to another star system, either forwards or backwards in time. For instance, if the ship is going to take 6000 years to travel to Alpha Centauri from the Solar System in normal space, if it makes a 6000 year time jump either forwards or backwards in time, it will arrive there instantaneously from the point of view of the crew and passengers on the ship. If the ship is in orbit around a planet and it makes that 6000 year time jump, it will still be in orbit around that planet either 6000 years later or 6000 years prior to making that jump.